Anacapa Island is actually a chain of three small islands, located twelve miles off the California coast and linked together by reefs that are visible only at low tide. The islands are named appropriately East, Middle, and West. West Island, the largest island of the group, is two miles long by six-tenths of a mile wide, and rises to a peak of 930 feet. Middle Island is one-and-a-half miles long, a quarter-mile wide, and 325 feet at its highest point. East Island is a mile long, a quarter-mile wide, and rises to an elevation of 250 feet. Just off the eastern end of East Island is a forty-foot-high natural bridge, named Arch Rock, which is a trademark for Anacapa Island and Channel Islands National Park. The islands were discovered by Juan Rodriguez Cabrillo in 1542 and given the name “Las Mesitas,” meaning Little Tables, by the Spanish explorer Gaspar De Portola in 1769. 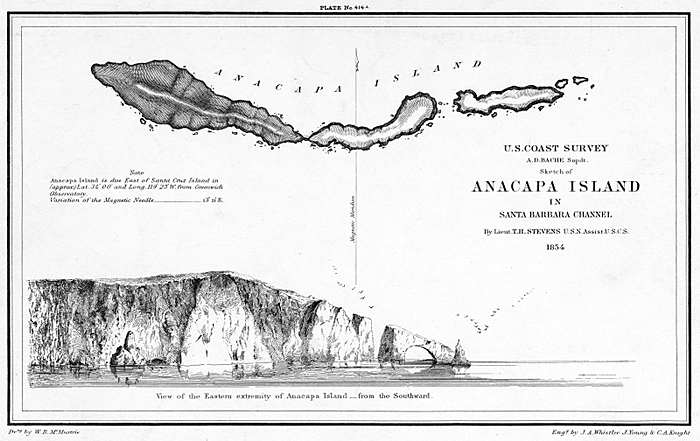 Captain George Vancouver later rechristened the islands Anacapa, derived from the Chumash Indian word, “Eneeapha,” which means island of deception or mirage. For most of the perimeter of the island, steep sea cliffs border the water. Revealed in these cliffs are lava tubes and air pockets, which indicate the islands volcanic origin. Many of these features are now sea caves, offering interesting points of exploration for kayakers. At 11 p.m. on December 2, 1853, the side-wheel steamer Winfield Scott ran aground on Middle Anacapa Island in dense fog, jolting its passengers awake. En route to Panama from San Francisco, the vessel had a passenger list that included individuals who had struck it rich during the gold rush. Although everyone made it safely to shore in the ship’s lifeboats, the atmosphere immediately following the wreck was frenzied as “every one was for himself, with no thought of anything but saving his life and his (gold) dust.” The Winfield Scott was a total loss, and its remains still lie submerged just north of the island. 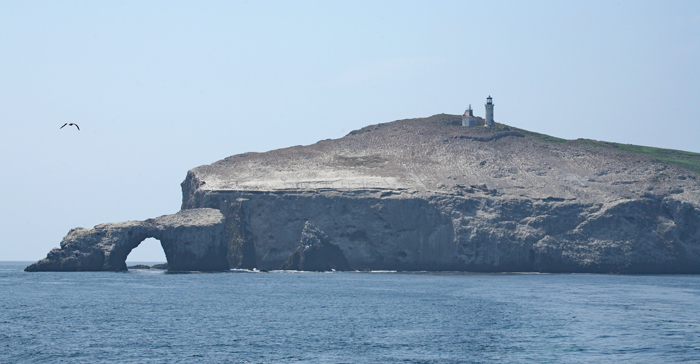 The notoriety of the grounding prompted President Franklin Pierce to issue an executive order reserving Anacapa Island for lighthouse purposes. 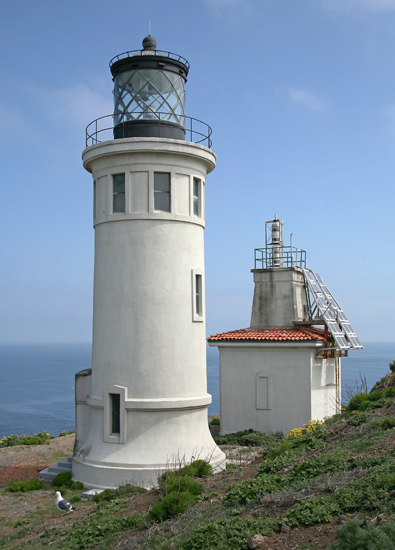 The U.S. Coast Survey visited the island in 1854 and concluded that, although the island’s position at the southeast entrance to the Santa Barbara Channel was a natural choice for a lighthouse, “it is inconceivable for a lighthouse to be constructed on this mass of volcanic rock – perpendicular on every face, with an ascent inaccessible by any natural means.” James Whistler, who later became famous for his painting of his mother, was part of the survey team and produced an etching showing the profile of the eastern extremity of Anacapa Island. 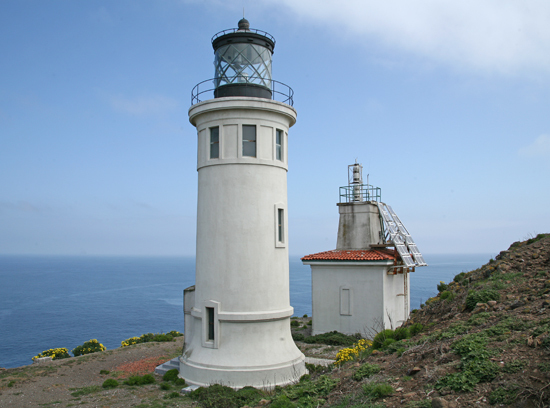 In 1874, a lighthouse was established at Point Hueneme, the nearest point on the mainland to Anacapa Island. 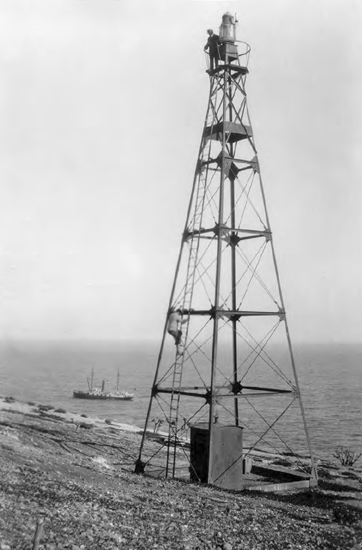 As shipping in the Santa Barbara Channel increased, the Lighthouse Board eventually did decide to place a light on Anacapa Island, but to limit the expense of building a station on the inaccessible island, an unmanned acetylene lens lantern on a fifty-foot, skeletal tower was erected. In addition to the low-maintenance light, which was activated on March 11, 1912 and required servicing just twice a year, a whistling buoy was anchored five-eighths of a mile off the east end of the island. On February 28, 1921, the steamer Liebre grounded on the east end of Anacapa Island directly under the light and sustained estimated damages of $40,000. The grounding must have happened in foggy conditions as inspectors noted that the whistling buoy had capsized and was not operational. 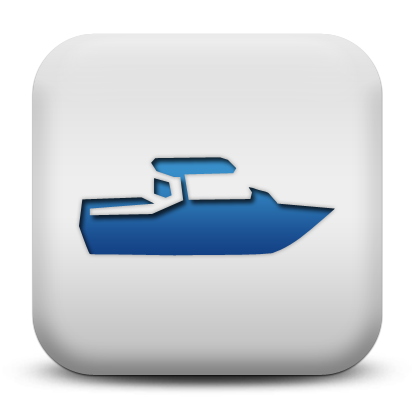 As approximately nine-tenths of all vessels trading up and down the Pacific Coast passed inside the islands of the Santa Barbara Channel, the American Association of Masters, Mates and Pilots petitioned for a proper fog signal on Anacapa. 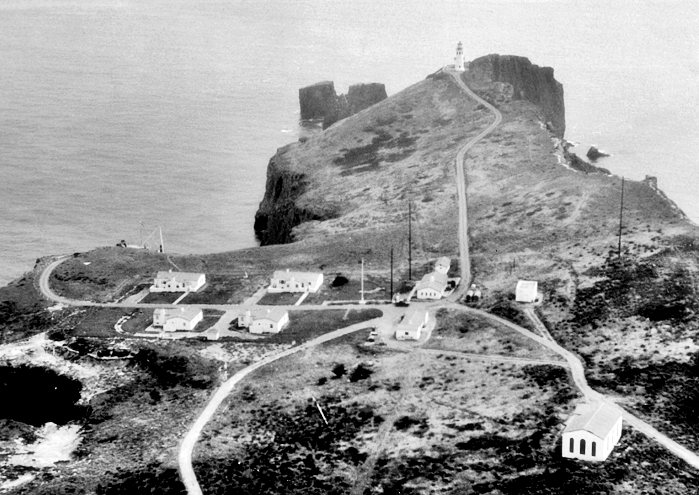 Funds for what would be the last major light station to be built on the west coast were finally allocated in the late 1920s. 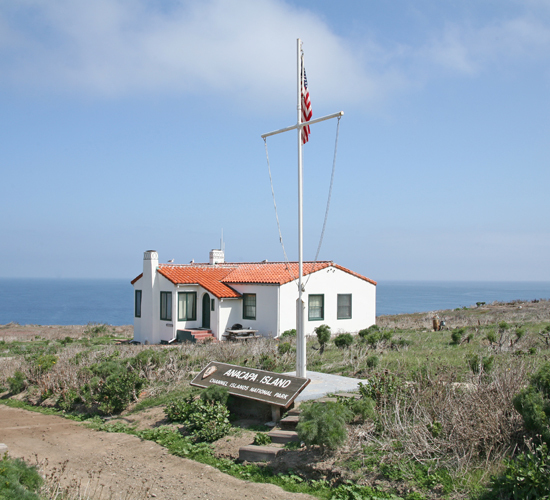 At the time, there wasn’t a fog signal between Point Vicente and Point Conception, a distance of 112 miles. The construction of the station was carried out in two phases and commenced in the spring of 1930. A landing dock, a hoisting crane, and roads were added first, and then work began on the various station buildings. A thirty-nine-foot, cylindrical tower and a fog signal were built near the highest point on the eastern end of the island. Four Spanish-style, white stucco houses with red tile roofs were provided for the keepers and their families. 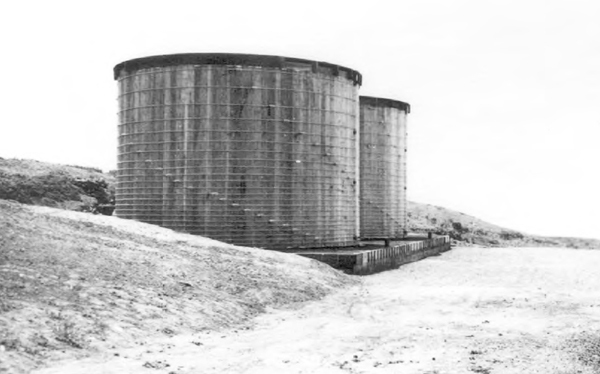 As the island had no source of fresh water, a large cement catchment basin, measuring 120 feet by 150 feet, was placed on the island to feed rainwater into two 50,000-gallon, redwood storage tanks located up the hill from the dwellings. The elevated location of the tanks provided sufficient water pressure for the dwellings, but a pump operated by compressed air was used to feed the fire hydrants. Unfortunately, the eight inches of annual rainfall typical for this arid climate only amounted to 30,000 gallons of water each year, and additional water had to be pumped up to the tanks from a tender that periodically called at the station’s cove. The tanks proved to be inviting targets to armed boaters, and a two-story cement building, known as the “church,” was later built to protect the precious water supply. A powerhouse near the four dwellings sheltered three five-kilowatt, 115-volt, compound-wound, direct-current generators, individually driven by 10-horsepower 1,200 revolutions per minute gasoline engines, that provided electricity for the station. 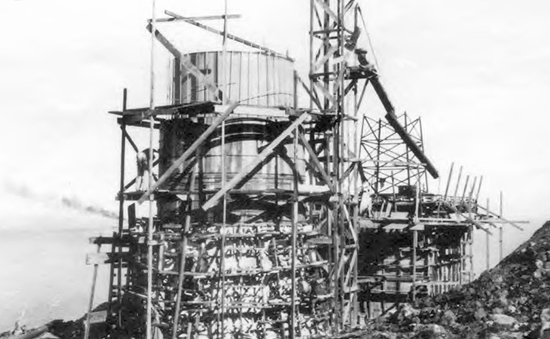 Gasoline for the engines was stored in an oil house located 125 feet from the powerhouse, and the oil house was on high enough ground to permit gravity flow to fuel tanks located in concrete pits near the powerhouse. Two gasoline engines that powered the compressors for sounding the station’s fog signal were also located in the powerhouse along with the radiobeacon equipment. Robert Imhoff, white Huskey Duke, and Ralph Lewis - part of last crew on island in 1967. 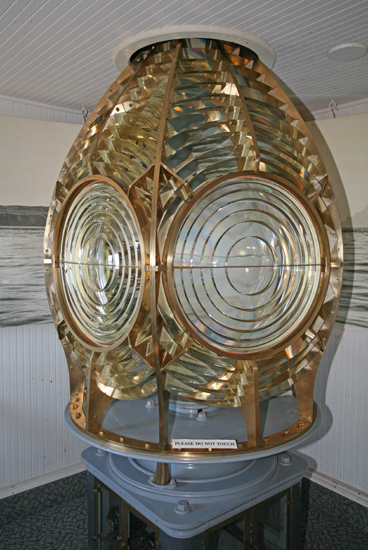 The light from the tower’s third-order Fresnel lens, manufactured in England by Chance Brothers, was first displayed on March 25, 1932 by Keeper Frederick Cobb, who had transferred to the island from Southampton Shoal Lighthouse. Equipped with three flash panels and performing one revolution every minute, the lens produced a signature of 0.1 second of white light, 11.9 seconds of darkness, 0.1 second of light, 11.9 seconds of darkness, 0.1 second of light, and 35. 9 seconds of darkness. 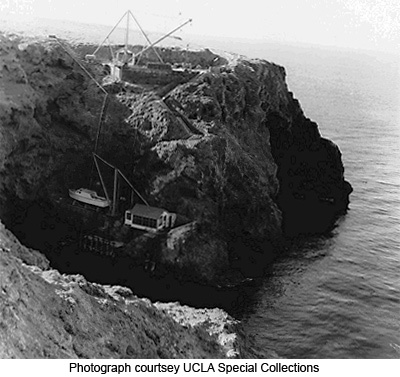 The fog signal building was equipped with two diaphones, one of which pointed toward Santa Barbara Channel to serve traffic along the coast, while the other pointed south to serve open-sea traffic. The light and fog signal stood roughly 270 feet above the ocean, and in 1933 Captain W.F.M. Corah of the steamship Golden Sun reported that he picked up the low note of the fog signal at a distance of twelve miles during a trip from San Francisco to Los Angeles. Living on an island ringed with cliffs could he hazardous. In November 1934, Catherine Coursey, wife of assistant keeper Charles R. Coursey, was critically injured in a fall, and the saving of her life was credited to the battleship California, which responded to an emergency call and rushed her to a hospital on shore. On June 5, 1948, Donald Thorne, a seventeen-year-old coastguardsman who had been serving on the island just over a week, was killed when he fell 150 feet from a cargo net being hoisted to the top off the landing. 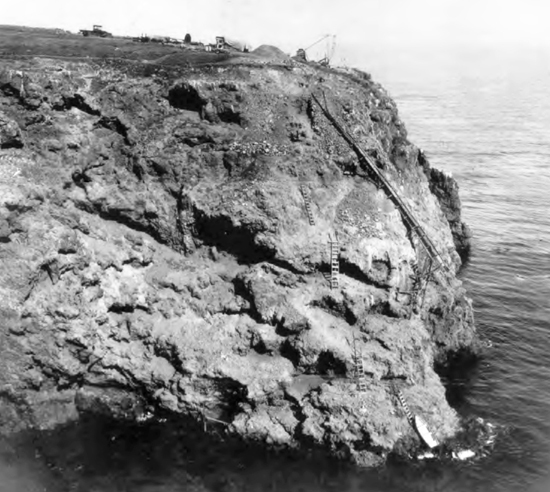 Stairs led up the cliff at the landing, but the men stationed on the island frequently caught a ride on the cargo net. 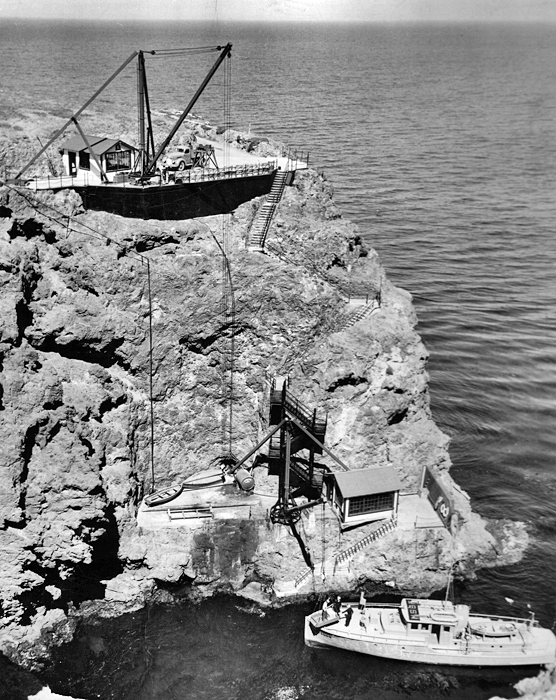 In March 1951, Roger Douke and Charles T. Collins, two coastguardsmen stationed at Anacapa Island Lighthouse, went out on a fishing trip near the island in a twelve-foot motorboat. When the men failed to return, a search was launched, and a plane soon spotted the men’s overturned motorboat in a kelp bed about a quarter-mile from the lighthouse. A Coast Guard cutter was dispatched to the scene and recovered the men's bodies the day after they were reported missing. Douke, who was in charge of the station, was living on the island with his mother, while Collins had his wife and a child at the station. In March 1956, the Coast Guard personnel on the island consisted of three couples, who each had one of the residences, and five bachelors who occupied the fourth dwelling. Lois Boylan, wife of Officer in Charge Larry Boylan, claimed that life on the island wasn’t as lonely as you might think. The three Coast Guard wives “would gab over the phone just like the girls on the mainland” even though they lived close enough to each other to lean out their windows and talk back and forth. Living in isolation also seemed to have a health benefit, as neither of the two Boylan children had been sick one day since moving to the island. In 1938, under the direction of Franklin D. Roosevelt, Santa Barbara and Anacapa Islands became Channel Islands National Monument. 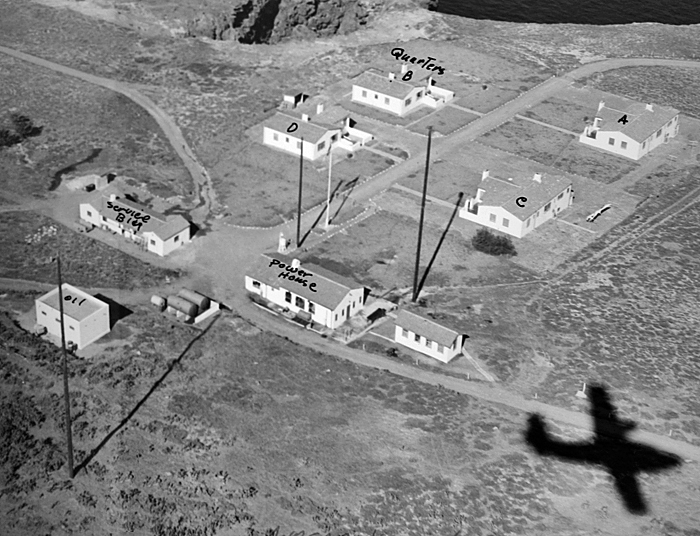 A plan was proposed in 1962 to convert the Coast Guard’s Anacapa Island Station to unattended operation and remove all personnel. One of the major reasons for this change was the test firing of missiles from Point Mugu that required island residents to spend several hours each week in a shelter. The station remained staffed, but starting in 1962, families were no longer allowed on the island, and all coastguardsmen stationed on the island shared a single residence. 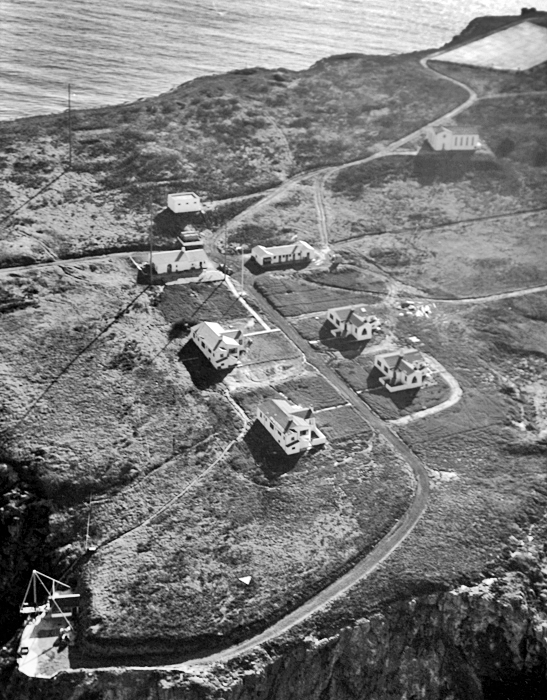 The three dwellings that had been unoccupied for a few years were demolished in May 1967, after the station was automated, and the remaining dwelling along with several other structures were slated for demolition in the fall of 1968 when Superintendent Donald M. Robinson of the Channel Islands National Monument placed a call to the Coast Guard on September 24. Robinson informed the Coast Guard that the National Park Service was interested in placing personnel on the island and would like to keep the remaining facilities. A cooperative agreement was signed between the Coast Guard and the National Park Service in 1970 wherein the Coast Guard would retain responsibility for the light and fog signal, while the park service would maintain all other buildings. In 1980, Congress designated five of the eight Channel Islands, Anacapa, Santa Cruz, Santa Rosa, San Miguel, and Santa Barbara Islands, and 50,500 hectares (125,000 acres) of submerged lands as Channel Islands National Park. 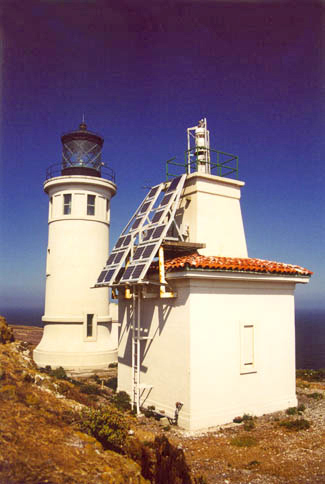 Visitors to Anacapa Island today can see the lighthouse, fog signal building, one of the original keeper’s dwellings, the water storage building, the powerhouse, and the third-order Fresnel lens, which was removed from the tower in 1989 and placed on display in the Anacapa Island Visitor Center, formerly the station’s service building. First Assistant: Thomas G. Lewis (1933 – 1934), Charles R. Coursey (1934 – 1935), Joseph May (1935 – 1938), Leo Y. Kellogg (1938 – 1940), Howard S. Fawcett (1940 – 1943). Second Assistant: Thomas G. Lewis (1932 – 1933), Charles R. Coursey (1933 – 1934), Allen O. Pecor (1934 – 1937), Leo Y. Kellogg (1937 – 1938), Howard S. Fawcett (1938 – 1940). Third Assistant: Charles R. Coursey (1932 – 1933), James E. Thomas (1935 – 1937), Leo Y. Kellogg (1937), Howard S. Fawcett (1937 – 1938), Charles H. Livesay (1938 – 1939). “An Island All Their Own,” Bob Reilly, Independent Press-Telegram, May 7, 1967. Channel Islands, Charles Hillinger, 1998. Channel Islands National Park, National Park Service pamphlet. 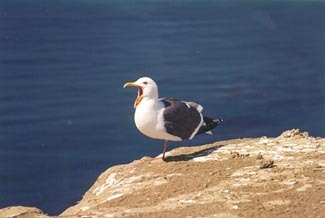 Located on Anacapa Island, part of the Channel Islands National Park, situated fourteen miles off the coast from Oxnard. 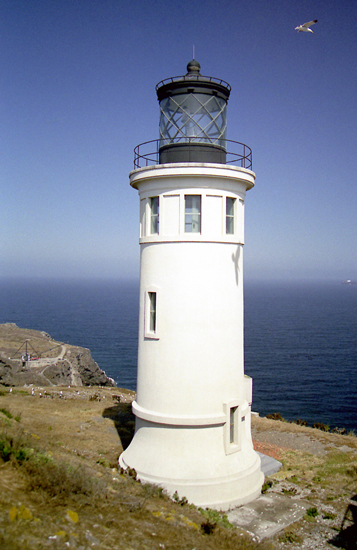 For a larger map of Anacapa Island Lighthouse, click the lighthouse in the above map. Island Packers, operating out of Channel Islands Harbor in Oxnard, is an authorized concessionaire to Anacapa Island and Channel Islands National Park. Visit their website for details or call them at (805) 642-1393. 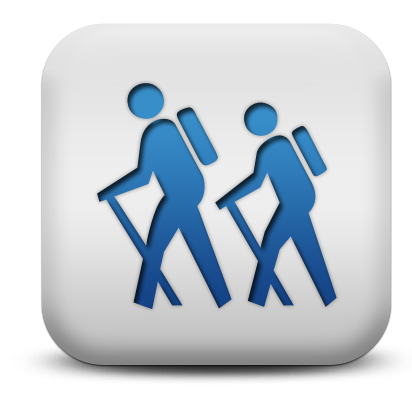 Camping, snorkeling, kayaking, and hiking are amongst the activities available for visitors. 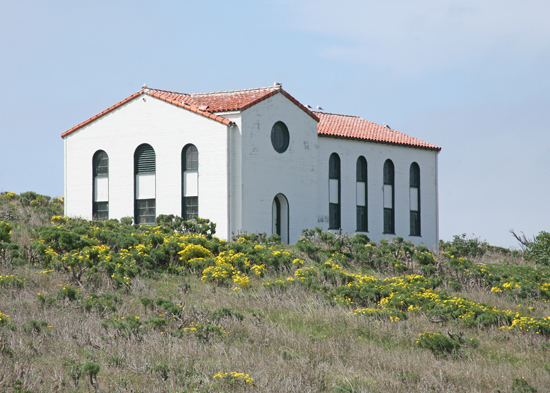 You can visit the grounds near Anacapa Lighthouse, though you might have to plug your ears due to the foghorn, but the tower itself is not open to the public. 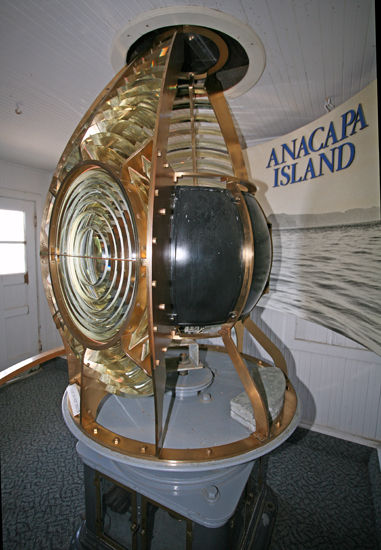 The third-order Fresnel lens, formerly used in Anacapa Island Lighthouse, is on display in the island's visitor center. 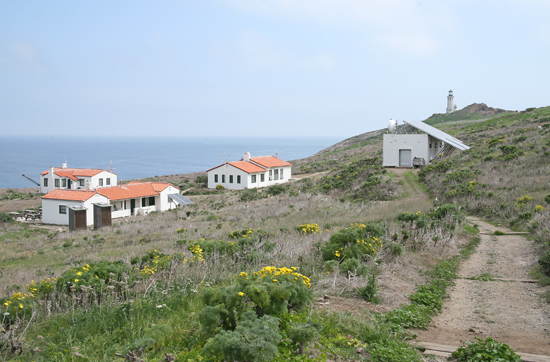 The lighthouse is owned by the National Park Service and is part of Channel Islands National Park. Grounds open, tower closed. Trips to Anacapa Island are offered year-round, but certain months offer some unique opportunities. For a few weeks in March and April, Anacapa's coreopsis, or tree sunflower, undergoes a marvelous transformation and its bare trunks disappear beneath masses of bright green foliage with showy yellow blossoms. The coreopsis lies dormant the remainder of the year. 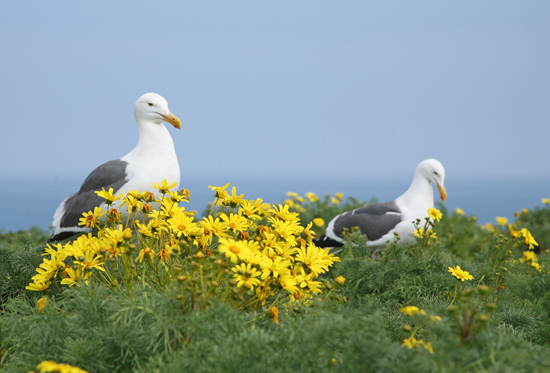 In April, hundreds of pairs of Seagulls return to the island to mate and hatch young. The young hatch in the latter part of May. The summer months are the best time for kayaking and snorkeling around the island, as the water temperature becomes tolerable. 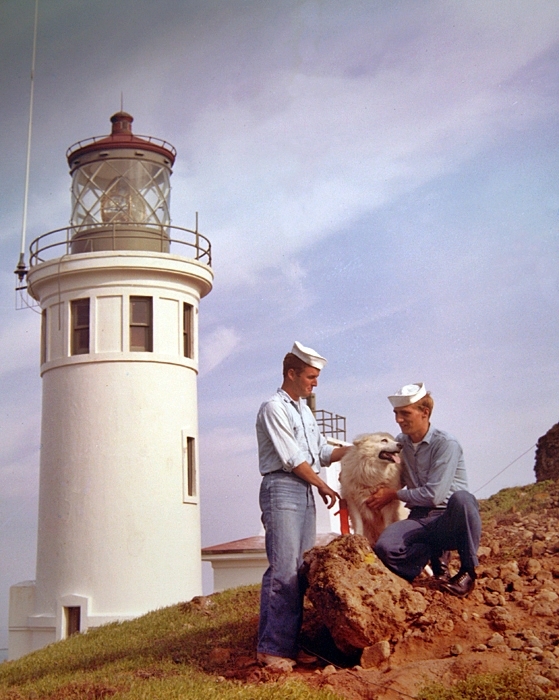 In 1965, Disney filmed a movie entitled "The Not So Lonely Lighthouse Keeper" on Anacapa Island that was later shown on the "Wonderful World of Disney." 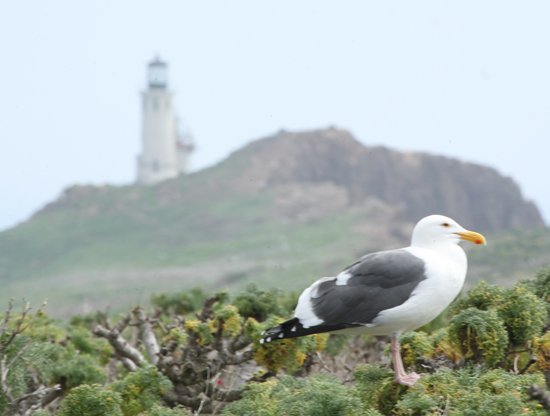 Shot on Anacapa Island, the movie featured Chuck Hastings as a peg-legged lighthouse keeper on a practically deserted island who finds finds hundreds of friends among the island's abundant wildlife. In addition to seeing the Anacapa Lighthouse, this is a great place to see leopard sharks, dolphins, different species of fish and sea lions. We enjoyed kayaking around the island and in and out of the caves.